For this swap you will have 3 partners. You will send each partner a store bought, or handmade, non-religious Christmas card inside of a decorated envelope. 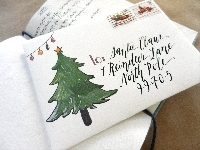 You may use, markers, stickers, rubber stamps, washi or anything else you would like to decorate your envelope. Please write something inside such as a nice note, funny Christmas Do's & Dont's list, recipe, poem, list of your favorite Christmas songs, or foods, family traditions, fun facts, etc. You will also include a flat surprise inside of your card. A flat surprise would be something like happy mail or snail mail stickers, washi tape, tags, a notecard, sheet of Christmas themed or profile based stickers, ephemera, postcards, maybe even a Christmas or profile themed ATC, Coin, Inchie, or Twinchie. Have a very merry Christmas & happy swapping! RULES: NEWBIES OK! No recent or unexplained 1's or 3's. Must have a good swapping history & a well filled out profile. I will be checking participants VERY THOROUGHLY before assigning. I angel all of my swaps as long as you rate your partner appropriately for not sending. If you have a concern about someone who has signed up please let me know privately. Your swap title suggests that the envelope is supposed to be decorated, but the swap description doesn't mention it. Is the envelope also supposed to be decorated? I went ahead and decorated the envelope because I assumed she meant us to. It makes the Christmas mail look so cheerful. Yes, please decorate your envelope. Just edited the swap description. Thanks for letting me know. When are partners being assigned?